Every company must keep accounting records to sufficiently explain the transactions and financial position of the company and enable true and fair financial statements to be prepared and audited. The records are to be kept at the registered office of the company or at such other as the directors think fit, and shall at all times be open for inspection by the directors. All companies are required to retain their accounting records for a period of seven (7) years after the completion of the transactions to which they relate. - A balance sheet as at the end of the financial year. - Subsequently, within 6 months of its financial year end. Financial statements shall be duly audited before they are sent to every member. - Circulation for a private company is within 6 months of its financial year end. - Circulation for a public company is at least 21 days before the date of its annual general meeting. - Lodgement for a private company is within 30 days from the circulation to its members. - Lodgement for a public company is within 30 days from its annual general meeting. - Accounts must be prepared in accordance to accounting standards approved by MASB. - In cases where certain authorities (e.g. Securities Commission or Bank Negara Malaysia) specify modifications to the approved accounting standards, the financial statements must be prepared in accordance to such modifications issued by the authorities. It is a statutory requirement that every company must appoint an auditor. 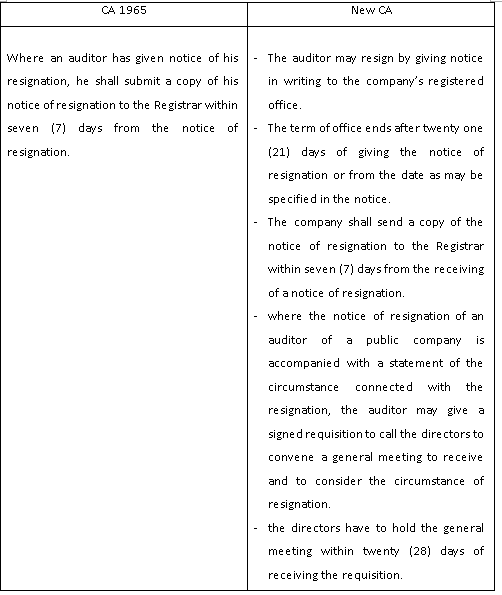 An auditor so appointed must be an approved company auditor and must not be closely associated with the company. The appointment of a firm as auditor of a company is taken to be the appointment of all the persons who are the members of the firm at the date of the appointment. A company shall appoint an auditor for each financial year of the company. The Registrar is empowered to exempt a private company from the requirement subject to conditions as determined by the Registrar. In the new CA, as the holding of an Annual General Meeting is not mandatory for a private company, the terms of office of auditors is in accordance with the terms of service. For a public company, the terms of office is from one AGM to the conclusion of the next AGM. - at a general meeting of the company. The auditor’s resignation will take effect on the appointment of another auditor. The auditor of a company has a duty to report to shareholders and should be present when the audited financial statements are being laid at a general meeting. In the new CA, the attendance of an auditor of a public company, or his representative at an annual general meeting where the financial statements of the company for a financial year are to be laid, is compulsory. In the case of a private company, the auditor or his representative will attend a general meeting of the company where financial statements for any financial year are to be laid when due notice of the intention to move a resolution requiring the presence of the auditor is given. Failure to attend is an offence unless the auditor proves circumstances beyond his control.